I made the hardware mainly from stuff I had laying around (for the Germans: Edelschrott) but also from some stuff I had to buy specially for this project. polygon mirror and laser assembly from Kyocera F1200 printer (not the FS1200, the F1200 is a very old model. It belonged to my father in the 90's). 1W 450nm blue Laser diode from ebay (40 Bucks) to replace the infrared one in the printer's assembly. The polygon mirror assembly is mounted vertically on the flatbed scanners sled. The flatbed scanner sled is the Vertical axis, and the polygon mirror deflecting the laser in the scanner is the horizontal axis. Each Horizontal line is scanned about 150 times before the sled moves on to the next vertical position. The laser is scanned by the mirror continually at 55 Revolutions of the mirror per second, or 333 Hz scanrate, as the mirror is hexagon shaped. The exposure pattern is produced by turning the laser on and of synced to the rotation of the mirror. There are two microcontroller boards used. One is a digital servo speed controller for the polygon mirror motor. It just runs the motor up to the exact speed when requested, and sends a servo locked signal while the motor is at the correct speed. The other Board is the main board, which has the current source to control the Laser, and a driver for the stepper motor. This Board is connected to the PC through an UART. The PC instructs the machine what to do. 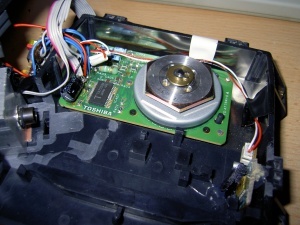 The PC can tell the main board to start the scanner and run the stepper to a specific position, and transfer data for scanlines, one line at a time. Each scan line is scanned about half a second, and then the PC tells the stepper to move on one position, and sends the data for the next scanline. During the half second, the line is exposed about 150 times. The original laser in a laserprinter is infrared, and that wavelength doesn't work for exposing pcbs. I removed the infrared laser, and mad-engineer helped me to make a nice aluminium laser mount, and mill down the mirror assembly to fit it. As the lenses in the polygon mirror assembly had the wrong optical properties for my application (different wavelength and different focusing distance), I removed them all. The optical system now consists only of the laser, its focusing lens, and the polygon mirror. There is one problem with this: as the beam length varies with the angle of the deflected laser beam, the focus of the laser lens would also have to be adjusted for each beam length. As this isn't done, the laser gets blurry at the ends and the middle of the scanline. But this is not a problem in practice, as the image gets sharp enough. 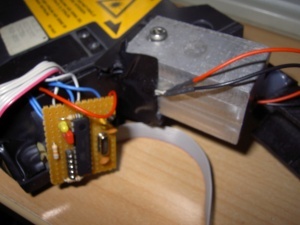 The main board controls the laser and the stepper motor. It has an atmega32 microcontroller as brain. 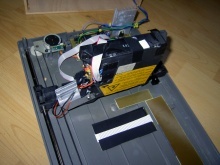 The laser is driven by a current source made from transistors, and the stepper motor of the flat bed scanner is driven by an uln2803. 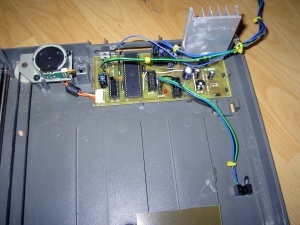 it runs on a 12V power supply, and makes 5V for the microcontroller with a 7805. The motor controller has an attiny2313 microcontroller, and it's own 78L05 to make a stable 5V supply (using the one from the cable would lead to instability, as the GND current varies in the cable because of the motor). 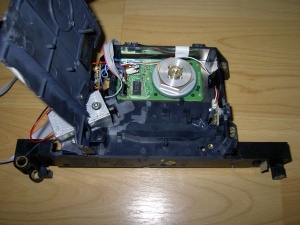 I reverse engineered the interface to the polygon mirror motor. It has 12V powersupply, a speed control pin, which accepts a strange range of voltages, and a symmetrical frequency generator output (FG). This output is a zig zag shaped induction loop around the motor, which generates a feedback frequency of how fast the motor is going. This is fed to the AVR's analog comparator. The microcontroller locks this signal to a reference frequency of 2kHz, which yields 55.555555555555... rotations of the motor per second, and 333.333333...Hz scanrate. Achtung: Schlitten nicht per Hand verfahren! Einstellungen müssen mit Apply übernommen werden. 300 mit Bungard-Basismaterial: Gut belichtet, jedoch auf werden die Freiflächen etwas angeätzt. (Vielleicht ist der Standby-Strahl zu stark). Vielleicht könnte man schneller belichten. Platine an den Anschlag hinten rechts anlegen. Wird die Klappe geöffnet, stoppt die Belichtung und wird nach schließen fortgesetzt. Achtung Platine könnte sich durch Erschütterung verschieben beim Öffnen. Das Layout der unteren Platinenfläche (BOTTOM-Layer) muss bei den folgenden Schritten vertikal gespiegelt werden! Oben wird Unten, Links und Rechts bleiben gleich! Bei dieser Methode wird nicht beachtet, dass man den Rest der Platine noch effektiv nutzen möchte. Anmerkung: Bei Europlatinen müssen die meisten Messschieber leider passen, da sie meist nur bis ungefähr 150 Millimeter messen können. In so einmal Fall kann man die Platine einscannen und z.b. in Gimp exakt ausmessen. Nützlich ist es dabei z.B. ein Geodreieck zu scannen und als Vergleichsmaß zu verwenden.